This good-sized image of Mary, the Mother of Jesus, is as the Immaculate Conception of Mary. It shows the Conception (as in being conceived) of Mary as the Virgin and thus she is without stain or blemish. 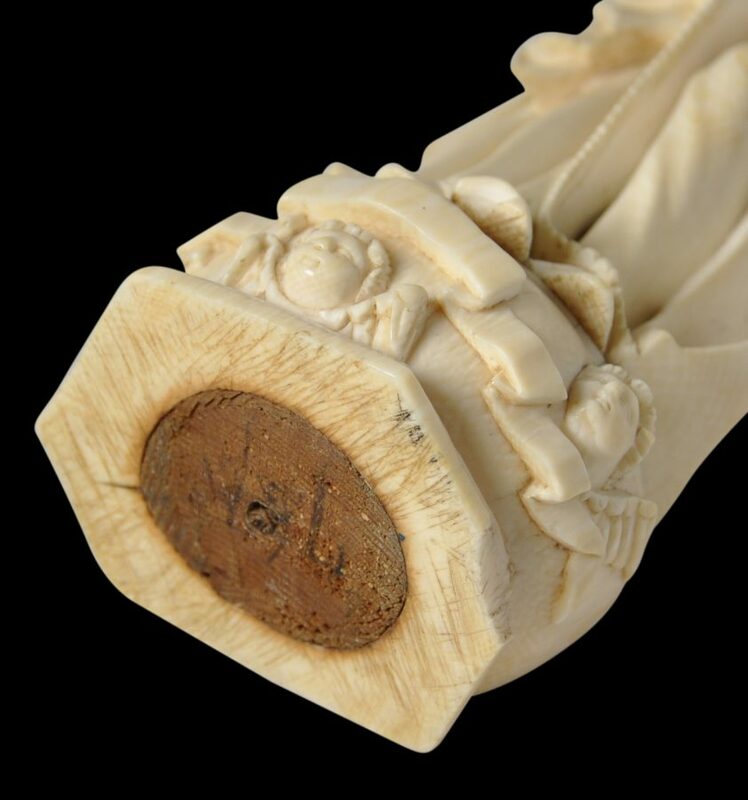 Ivory was an ideal material to show this attribute of Mary, for it is without stain or blemish, or at least can be perceived as such. There rendering here has all the characteristics of an ivory from the Portuguese colonial enclave of Goa: Mary’s hair is shown as well-defined, flowing locks; the hair is also pulled back over the head in the Indian manner; she is in flowing garb that is almost sari-like, with plenty of pleats to suggest movement; the neckline and cuffs of her dress are pearled or serrated; her left leg is placed slightly forwards so that the outline of her left knee is apparent through her dress; and her feet rest on a crescent moon or medialuna. The crescent moon, in turn, rests on an ivory block carved with seraphim. Many Goans converted to Christianity under the Portuguese. Local religious art developed syncreatic elements: it was predominantly Christian but incorporated Hindu Indian influences. The Jesuits played a critical role in Goa: Francis Xavier, the Spanish-born pioneering Roman Catholic and co-founder of the Society of Jesus (the Jesuits) was ordered by Ignatius Loyola, the principal founder of the Jesuits, on behalf of the Portuguese king to undertake a mission to the Portuguese East Indies. The king had become concerned that Christian values in the possessions had become deteriorated. Xavier left Lisbon in April 1541, and after first visiting Mozambique he reached Goa in May 1542, where he spent the next three years strengthening the position of the Church. Thereafter, the Jesuits played a key role in developing the Church’s infrastructure in Goa: churches, monasteries and Catholic schools were built. There are no repairs or noteworthy cracks. There is some minor loss to the serrated edge of Mary’s dress in just one small area. The hollow of the tusk has been filled-in with a wooden block. BBL, De Goa a Lisboa, Europalia 91, 1991. Levenson, J.A, et al, Encompassing the Globe: Portugal and the World in the 16th & 17th Centuries, Arthur M Sackler Gallery, 2007. Manuel Fores, J., et al, Os Construtores do Oriente Portugues, Comissao Nacional Para as Comemoracoes dos Descobrimentos Portugueses, Porto,1998. Museum of Christian Art, Museum of Christian Art, Rachol, Goa, 1993. Pal, P., A Collecting Odyssey: Indian, Himalayan and Southeast Asian Art from the James and Marilynn Alsdorf Collection, The Art Institute of Chicago, 1997. Pereira, J., Churches of Goa: Monumental Legacy, Oxford University Press, 2002. Trusted, M., The Arts of Spain: Iberia and Latin America 1450-1700, V&A Publications, 2007. Vickers, M. et al, Ivory: A History and Collector’s Guide, Thames & Hudson, 1987.